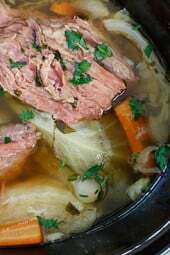 I’m sure many of you will be enjoying the classic Irish-American dish, corned beef and cabbage, which I am sharing from the archives! 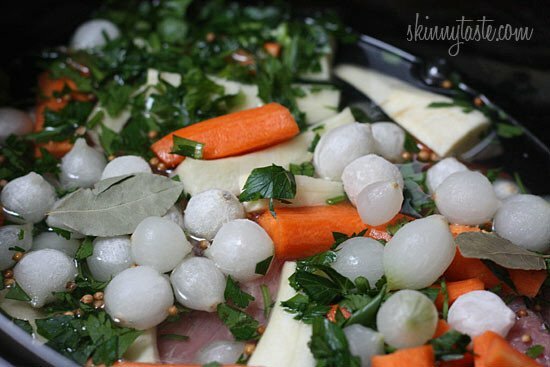 So easy to make in the slow cooker, I used frozen pearl onions and parsnips instead of potatoes to make this easy-peasy! 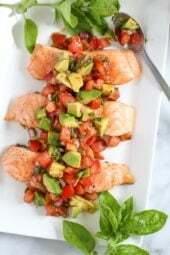 A perfect festive dish for the upcoming St Patrick’s Day holiday. Here is my original stove top Corned Beef and Cabbage with Horseradish Cream, I also have a Corned Beef and Cabbage Soup. Another festive dinner idea is my lightened up Shepherd’s Pie. 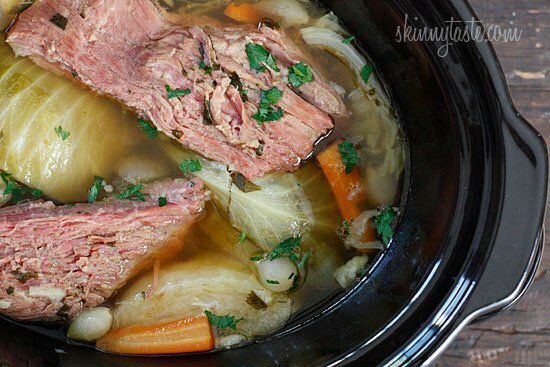 Making it in the slow cooker is the perfect solution for a busy schedule. Trim all the fat off to keep it lean. I purchased a 2 1/2 lb piece or corned beef brisket, after I trimmed all the fat off it was 2 lbs. Once cooked it shrunk to 18 oz. This was my second attempt at this dish in the slow cooker, my first version I put everything in the pot and turned it on. This resulted in overcooked cabbage that turned to mush. Second time around I added the cabbage at the end and it was perfect! I like to serve this with a side if Cauliflower Mash or Buttermilk Mashed Potatoes and a little mustard or horseradish cream on the side. How do you enjoy your corned beef? In a 5-6 qt crock pot, place brisket, carrots, parsnips, pearl onions, parsley, bay leaves, peppercorns and 3 cups of water. 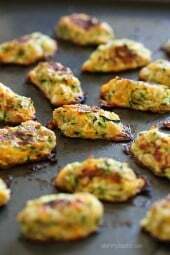 Remove meat, slice and serve with Cauliflower Puree or Buttermilk Mashed Potatoes. Enjoy! Dont ever trim fat off of a cut of meat before you cook it. Its the fat that makes the meat tender, combined with slow cooking. Removing the fat will greatly reduce the juicyness and tenderness of the meat, as well as hinder the flavor. Used the spice packet that came with the corned beef plus some garlic powder and the peppercorns & bay leaves in your recipe. Added peeled baby yukon gold potatoes the last hour. Instead of adding the carrots & cabbage to the crock pot, I roasted them at 400 with some salt, pepper, garlic powder, crushed rosemary and olive oil until caramelized. Everything was delish. Soo easy and delicious! The meat was so tender and moist. I added the seasoning packet that came with the meat and substituted red onions and potatoes for the parsnips and pearl onions. Would definitely recommend!! I don’t know what I did wrong- I followed the directions to the letter but the veggies were crisp not soft, and the meat was not melt in your mouth cooked but tough. I cooked it on high in my crock pot for close to 6 hours. What went wrong? By the way, my crock pot is pretty new, only used it a few times with no problems. What I do wrong? I have an almost 5 lb corned beef- do I need to adjust the time?? We had to play a bit as our cornered beef had spices included, and due to a time crunch at the end, we steamed the cabbage separately. However, this was a great outcome, and successful St. Patty’s dinner. Thank you!!! How long can this be cooked on low instead of high? Also, I didn’t think that parsnips had any points? Looking forward to making this next weekend!!! Thank you so much for all your delicious healthy gluten free recipes. My question is regarding the corn beef and cabbage. Do I add the spice packet also? Hm, there is no spice packet in this recipe. I add the spice packet that comes with the corned beef. Always turns out yummy! Just a few extra spices. I don’t see where the sodium is coming from. The ingredients list doesn’t show salt or broth. Is the meat itself salty? Also if I were to add baby potatoes, when should they be thrown in? Thanks! I don’t add any salt to it. I also don’t add any spice packets. We cook it in its own juice. I add in the potatoes in the beginning. Cabbage is usually towards the end – crockpot I think I throw in the last hour, if on the stove top its in the last 15 minutes. 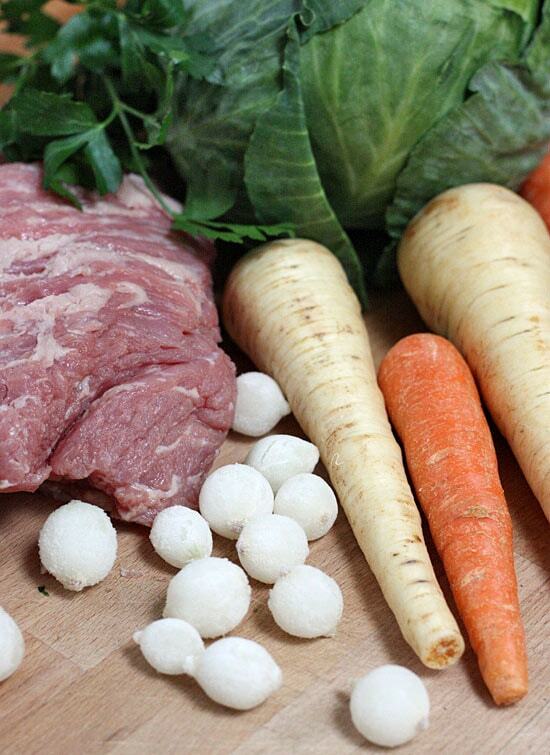 Corned beef gets its name from small chunks of salt, commonly called, “corns”, that the beef is cured by, hence the reason sodium content is high. Corned beef is essentially beef cured with salt brine. The corned beef itself is full of salt. Thats where the “corned” part comes from. You can reduce the salt by rinsing well before cooking. I add any spice packets that come with the corned beef in when cooking it. Is corned beef brisket already seasoned in a pouch or is it just the cut of beef that is called that way? I mom would make this many years ago. I cannot find it anywhere. Yes it is already seasoned. Can you add potatoes to this? Would you need to add more water? Reading the nutrition information on both the Instant Pot and crock pot why is there a big difference in the amount of sodium between both of them? Instant Pot said 164 mg of sodium, and 960 mg of sodium using the crock pot. I didn’t see either of the recipes adding sodium to the recipe. I didn’t make this recipe yet. I wanted to get the correct amount of sodium first. great question, they should be the same. Of course, it will vary with every brand of corned beef you use. 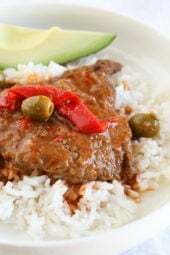 Why is this recipe more points than the instant pot version recently posted? Ingredients seem to be the same. Thanks!